This article aims to review the role of immunotherapy in tumors of the head and neck, focusing primarily on US Food and Drug Administration (FDA) approved checkpoint inhibitors in squamous cell histology. The data showing superiority of checkpoint inhibitors over cytotoxic chemotherapy that led to FDA approval of two agents (Keytruda® Merck and Opdivo® Bristol-Myers-Squibb) in the recurrent and metastatic setting will be reviewed in detail, as well as summaries of ongoing trials for checkpoint inhibitor and combination therapies in both the curative and metastatic settings. Upcoming positive data regarding immunotherapy use and other innovative immune based therapies in rare histologies such as nasopharyngeal carcinoma and salivary gland tumors will also be reviewed. Additionally, data regarding management of immunotherapy side effects will be discussed and a brief review of recently published guidelines will be provided. Lastly, we will address risks to special patient populations that need further study. J Unexplored Med Data 2018;3:7. Colon cancer is still one of the most common neoplasias every year, although screening strategies have reduced its incidence. Unfortunately, the median survival in metastatic cases, not candidates to surgery, remains less than 3 years, far away from the expectations. A few years back, new agents were introduced in its armamentarium. Bevacizumab and cetuximab created hopes then. However, systemic options have not evolved as quickly as expected and fluorouracil-based chemotherapy is still the standard. Moreover patients stop responding at some point due to resistance to these agents and disease progression after two lines of treatment entails a short survival. However, some patients are still able to receive further treatment and thus, new agents are urgently needed. The appearance of immunotherapies has opened a hopeful new therapeutic approach. These treatments alter the immune system and although these have shown efficacy in multiple cancers, colon is not one of them. However, emerging data show that there are some patients who may benefit. This article will review published and ongoing clinical trials of immunotherapy in colon cancer. J Unexplored Med Data 2018;3:8. Aim: To evaluate the association between local-regional treatment strategies on overall survival (OS), we compared elderly patients with ductal carcinoma in situ (DCIS) who underwent lumpectomy alone vs. lumpectomy + radiation or mastectomy. Methods: Patients ≥ 70 years in the National Cancer Data Base (2004-2015) with DCIS who underwent lumpectomy or mastectomy were selected. Kaplan-Meier curves were used to visualize the unadjusted OS. A Cox proportional hazards model was used to estimate the effect of local-regional treatment on OS after adjustment. Separate subgroup analyses were conducted for grade 1, estrogen receptor positive (ER+), and low-volume (< 3 cm) disease. 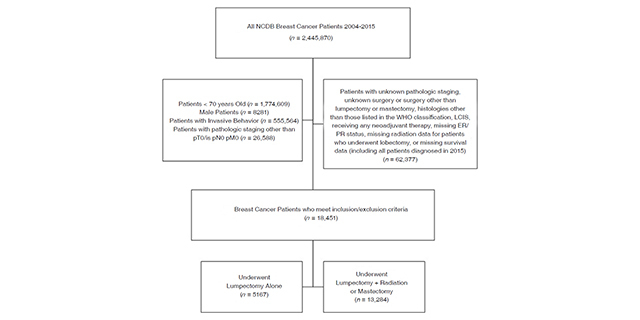 Results: 18,451 patients met inclusion criteria (n = 13,284 lumpectomy + radiation or mastectomy; n = 5,167 lumpectomy alone). The unadjusted 10-year OS was 54% for the entire cohort. After adjustment, patients who underwent lumpectomy + radiation or mastectomy had a slightly improved OS (vs. lumpectomy alone; HR = 0.841, 95%CI: 0.774-0.914). For patients with grade 1 disease, lumpectomy + radiation or mastectomy was not associated with an improved OS (P = 0.12). For patients with ER+ disease, (lumpectomy + radiation or mastectomy) + endocrine therapy yielded the most significant improvement in OS (HR = 0.669, 95%CI: 0.598-0.748). Among patients with low-volume disease, lumpectomy + radiation or mastectomy was associated with an improved OS (HR = 0.812, 95%CI: 0.725-0.91). Conclusion: Our data suggest that chronologic age alone should not preclude a patient from receiving standard therapy for DCIS, while patient fitness, competing comorbidities, and patient preferences are critical factors to consider in light of potentially limited benefits of treatment. In favorable cancer diagnoses such as DCIS, thoughtful omission of standard therapy may be considered. J Unexplored Med Data 2019;4:2.